When I think of Arby’s, I think of one thing – the horsey sauce. They are most famous for the roast beef, but I wouldn’t think of eating there without a gallon of their delicious horsey sauce to spread on my sandwich and dunk my curly fries in. The first Arby’s restaurant opened in Boardman, Ohio on July 23, 1964 by Leroy and Forrest Raffel. They decided on the name Arby’s from the initials R.B., which stood for Raffel Brothers. The franchise grew quickly and the menu was refined. They added their famous horsey sauce in the 1970s, along with curly fries and the beef and cheddar sandwich. Today, there are more than 3,500 Arby’s restaurants. 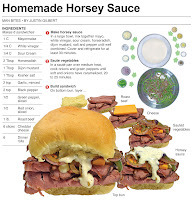 For this recipe, I make my own version of horsey sauce. It’s a modified version of a mayo-based barbecue sauce that is popular in the South. To it, I add horseradish, dijon mustard and some finely minced garlic for some zing. 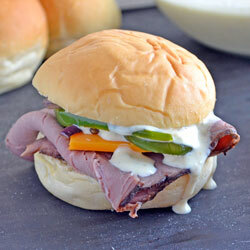 I slather it on a sandwich featuring roast beef, cheese and sautéd veggies – creating an Arby’s feast at home. 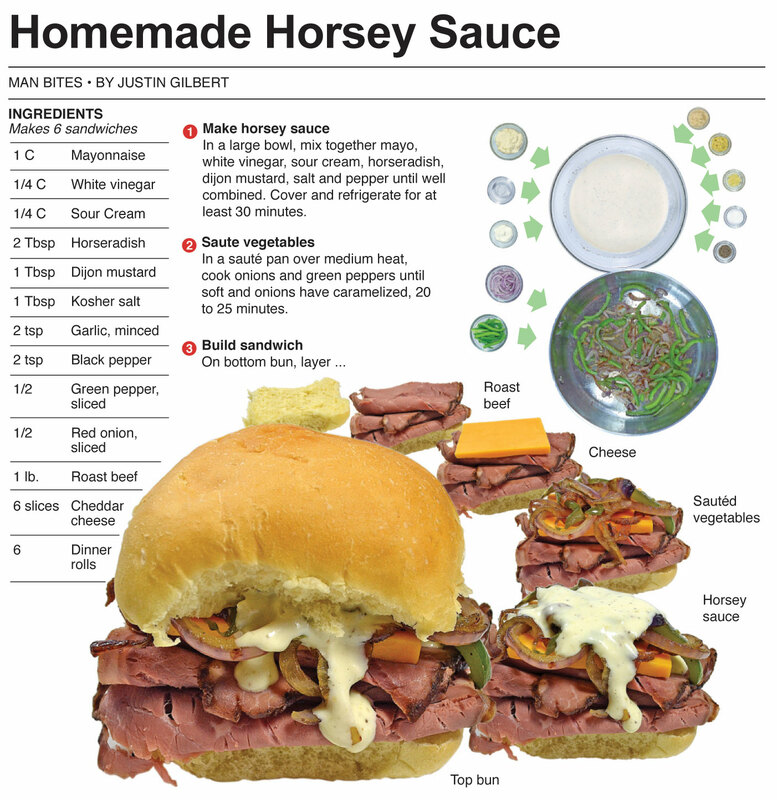 I had another recipe ready to go for my weekly column for print, but then I had a craving for horsey sauce and roast beef before settling in to watch the divisional round of the NFL playoffs. I documented it and decided to go with it. In the past, I have made this sauce to accompany steaks on the grill, but because it is winter here in Northern Indiana, I went the roast beef sandwich route. 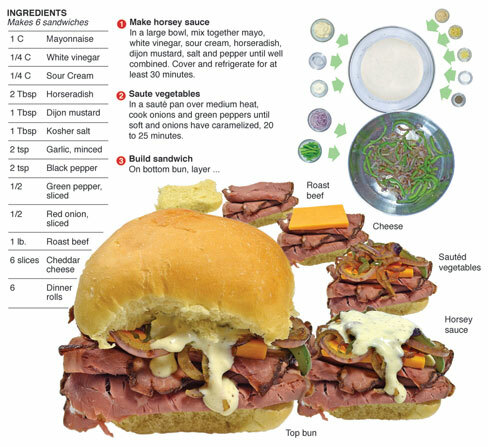 There is something about horseradish and beef that really works for me. I bought this roast beef at the deli in one of the many super markets we have here in Fort Wayne. I would love to have made it myself but I think roast beef is an involved enough recipe to merit an entire post all to itself. The store-bought roast beef used here was, I have to admit, delicious and tender. (And expensive, $16 for 1.5 pounds!) It will take a little time to actually top it with a recipe of my own - better get to work. Awesome! Pinned for later, I don't want to forget about it.